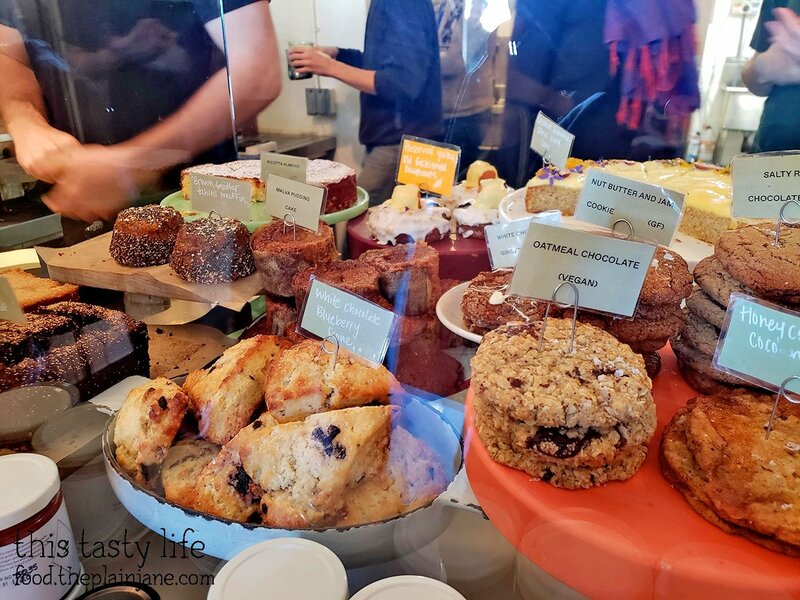 Last month I took a little trip up to Los Angeles to see Alyssa, former blogger here before This Tasty Life was called This Tasty Life! I went up early on a Saturday morning and we spent the day eating all over LA. Woo! 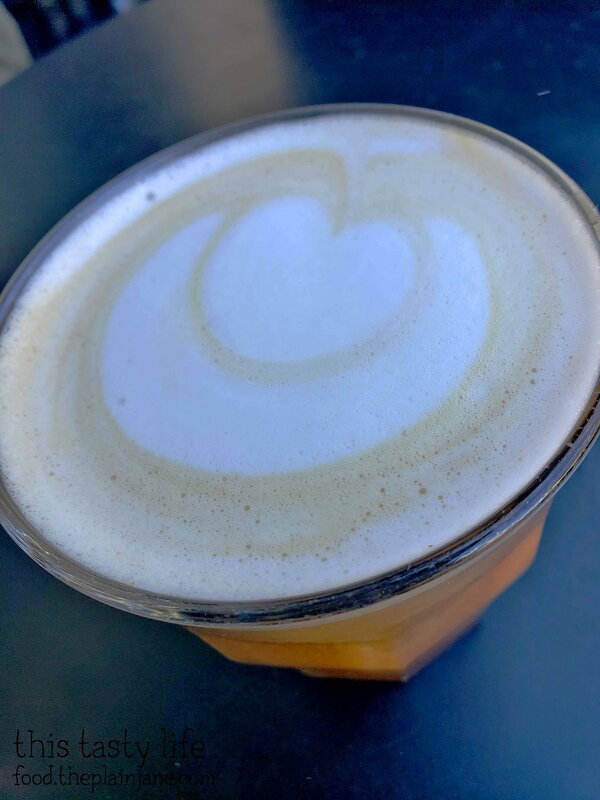 The first place we went to was Sqirl in Hollywood/East Hollywood – whatever you want to call it. See that crowd in the dark part of the photo? Yup. That’s where we were going. 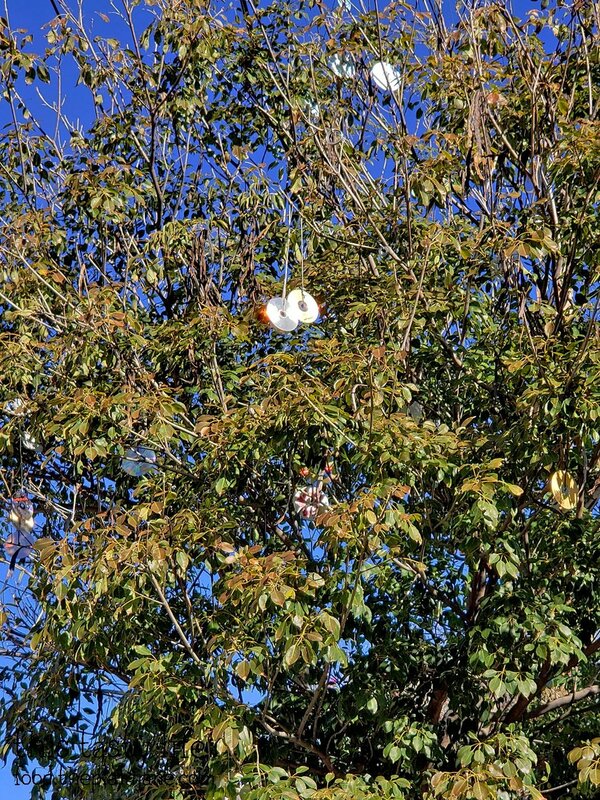 We parked about a block away and I immediately noticed that there were CD’s hanging from all of the trees on the street. Here’s a closer look. 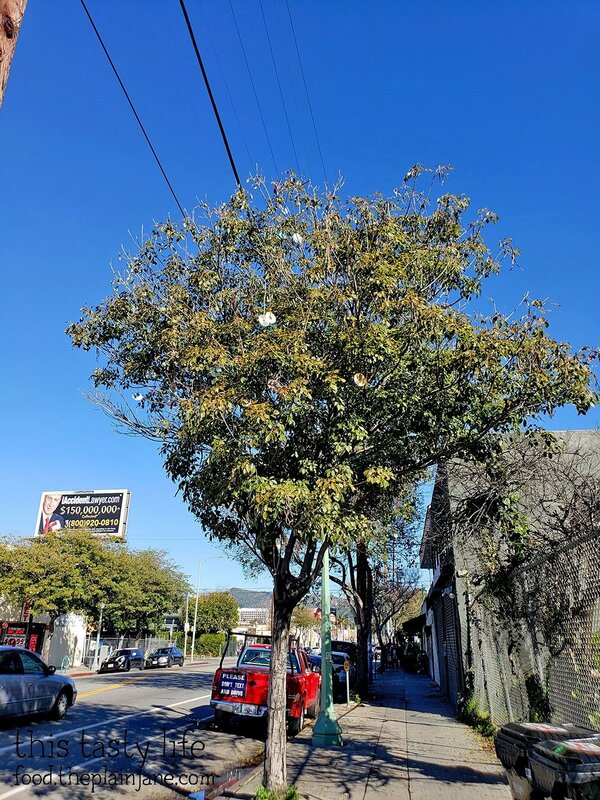 You can see the CD’s hanging from the trees all along the sidewalk here. A google search tells me that this is supposed to be a deterrent to keep birds away. I didn’t see any birds. Maybe it works. Alyssa and I jumped in line for Sqirl and proceeded to wait. The line was wrapped around the building and up the sidewalk. It gave us time to chat and catch up, so we didn’t really mind the wait. Here’s part of the menu from that day. Not that you can easily read it. But the Sqirl menu is online WITH the prices, so that’s easier. We looked at the menu on our phones to decide what we wanted before we got to the register. Look at all of these temptations in the case! 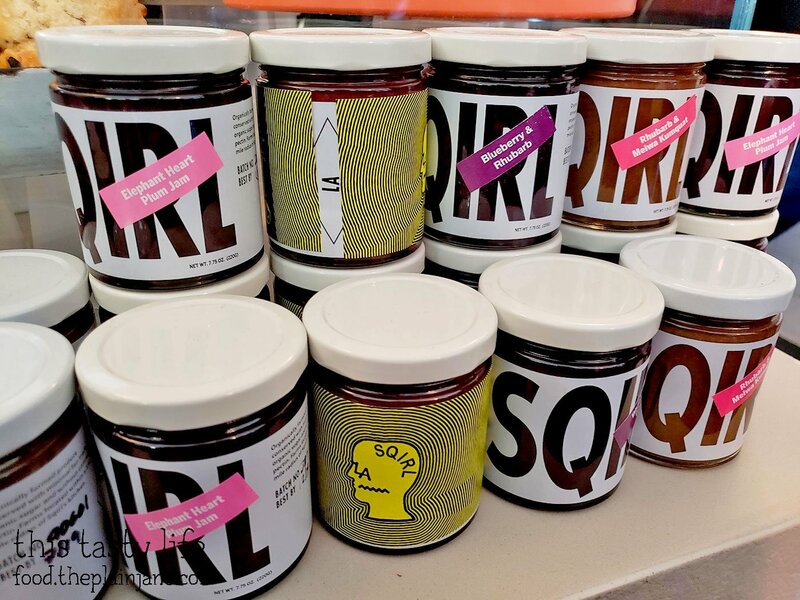 Plus their jams are available for sale. For the life of me I can’t remember what hot beverage Alyssa got. But this is it! 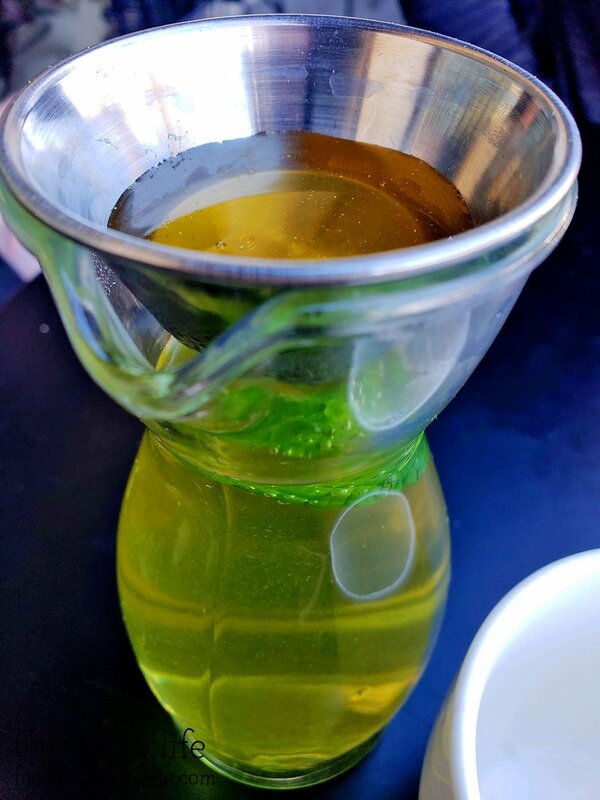 I went with a hot mint tea (it was chilly outside). With honey on the side. Which they placed in the cutest container on top of my tea! 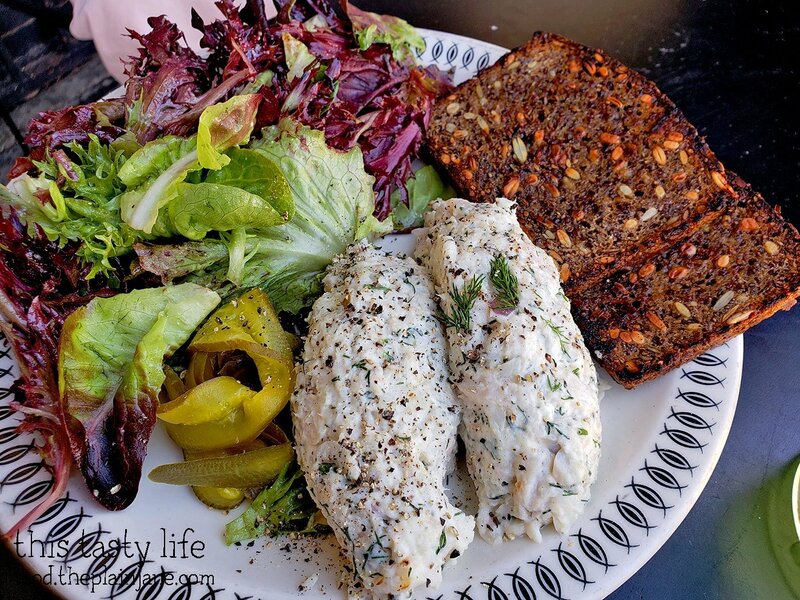 For Alyssa’s meal, she chose the Larry David [$15] which came with house smoked whitefish, pickles, Rugbrød (rye bread), and shu greens. I didn’t try any of this personally since pretty much none of it appealed to me. Ha! One thing I was definitely looking forward to was trying their Ricotta Toast [$9]. I made it “Rainbow” for an extra buck. “Rainbow” = multiple jams on top! 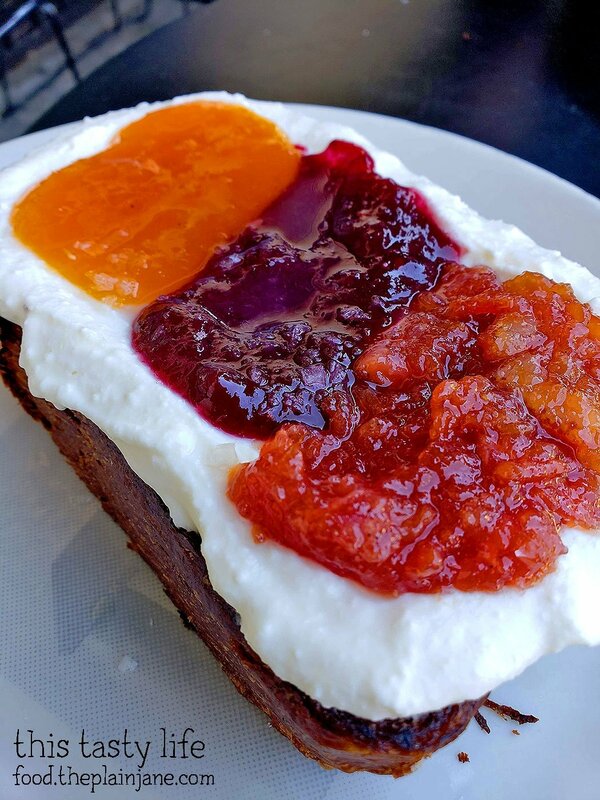 The toast is made with a thick cut piece of brioche and slathered heavily with sweet, creamy house ricotta cheese. There was also a salty element to the toast – maybe from the bread? – that made all of the flavors play well together. 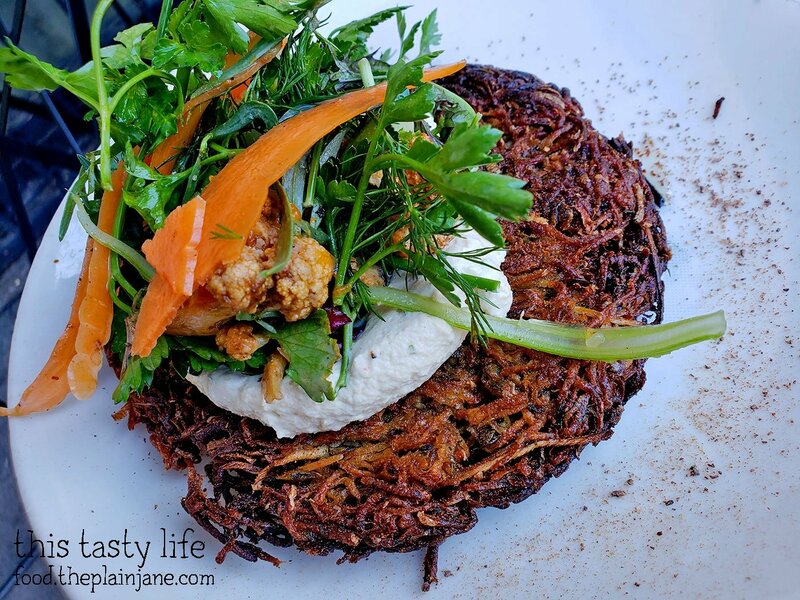 You had crunchy, soft, creamy, salty, and sweet all combined into one toast – I loved it! I SHOULD have found out what the jam flavors were, but now I don’t know. But they were a delicious addition and the jams change with the seasons. Alyssa and I shared the Big Tot [$12]. It’s a potato & chickpea flour tot with smoked Marcona almond chive schmear and veggies marinated in preserved meyer lemon chili vinaigrette. The veggies tasted like pickles to me. I liked the schmear, but I didn’t love the tot. It tasted kind of burnt to me and there was a rye-like flavor to it that I didn’t really care for. For my breakfast at Sqirl, I picked out this Chicken & Rice Porridge [$14.5]. When it was served to me, I was surprised since it didn’t look like porridge to me! It also didn’t really taste like porridge, it tasted more like a chicken tortilla soup! A really delicious chicken tortilla soup! They make this with kokuho brown rice, tomato, dried lime, ginger, turmeric, cardamon, and ghee with crunchy onions on top and cilantro on the side. This was AMAZING! 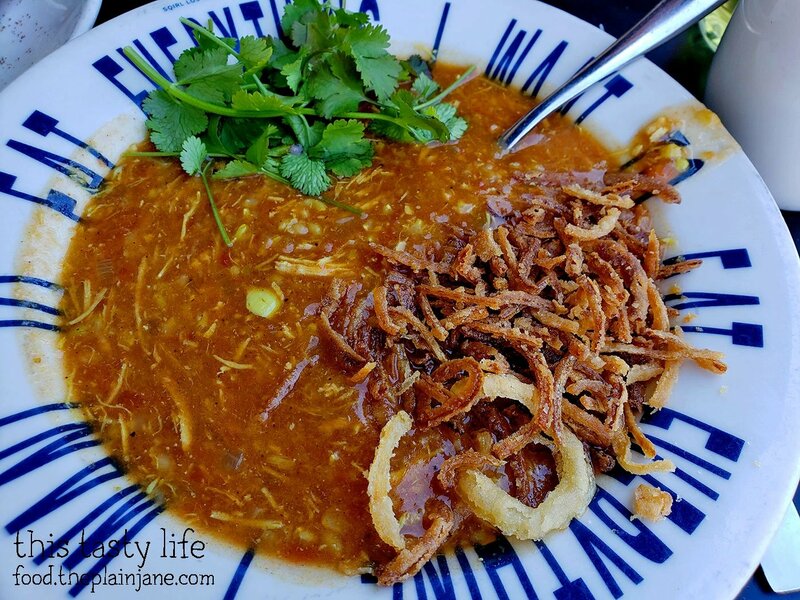 It was super flavorful and I loved the crunchy onions and bright fresh flavor of cilantro with the soup. 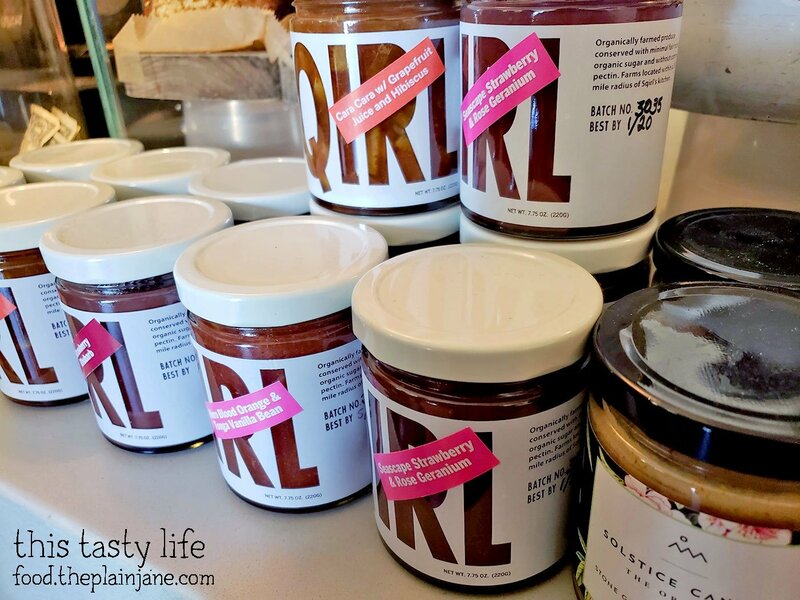 Definitely my favorite item at Sqirl that day (though the ricotta toast was a very close second). 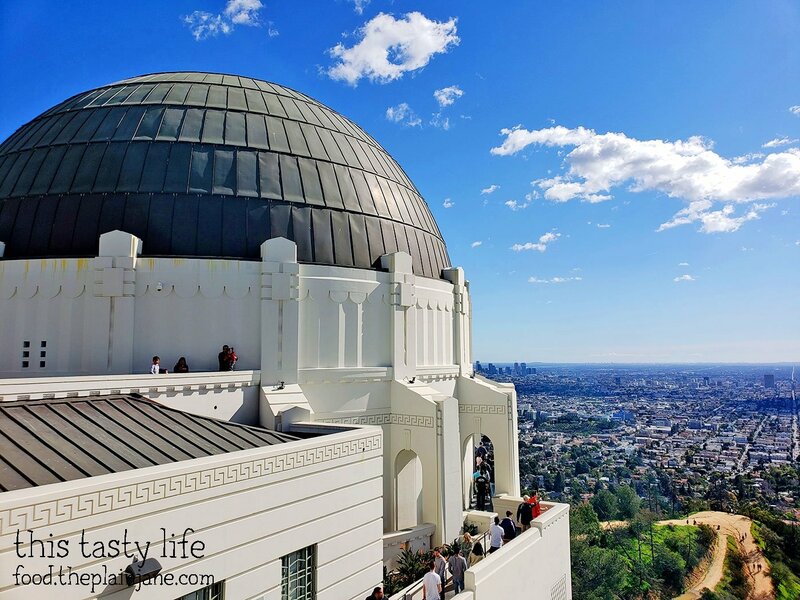 We didn’t have any set plans for the day and we decided on a whim to go to the Griffith Observatory since I had never been there before. 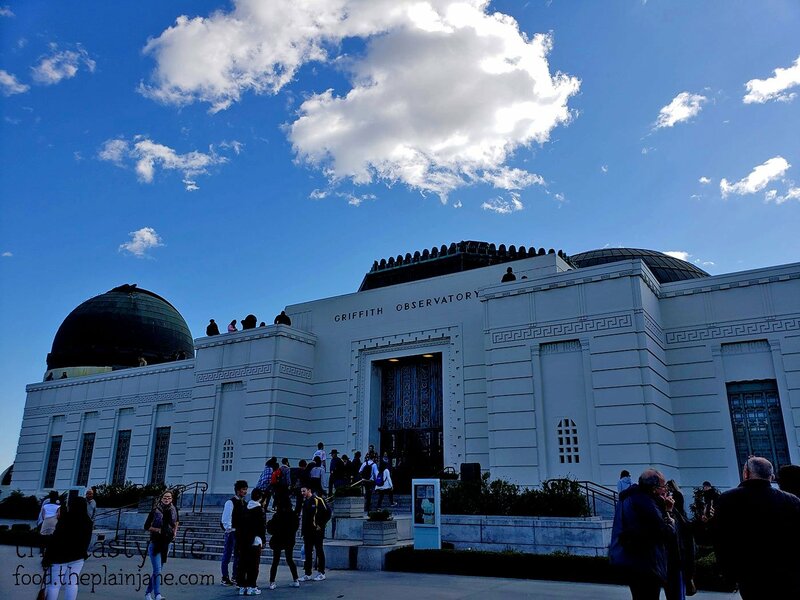 We drove around the entire place before parking down below the observatory and taking the shuttle up. The shuttle is $0.50 cents each way. They don’t give change. It was a rain-free weekend the day I visited but with all of the recent rains, the smog had cleared out and you could see to the ocean. Alyssa told me she had not seen a day so clear before! 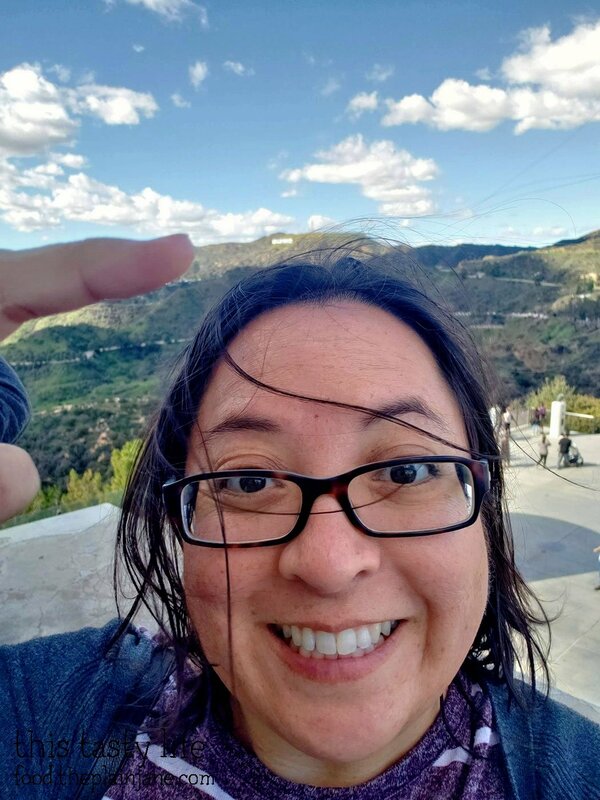 The Hollywood sign is just above my head. There it is! 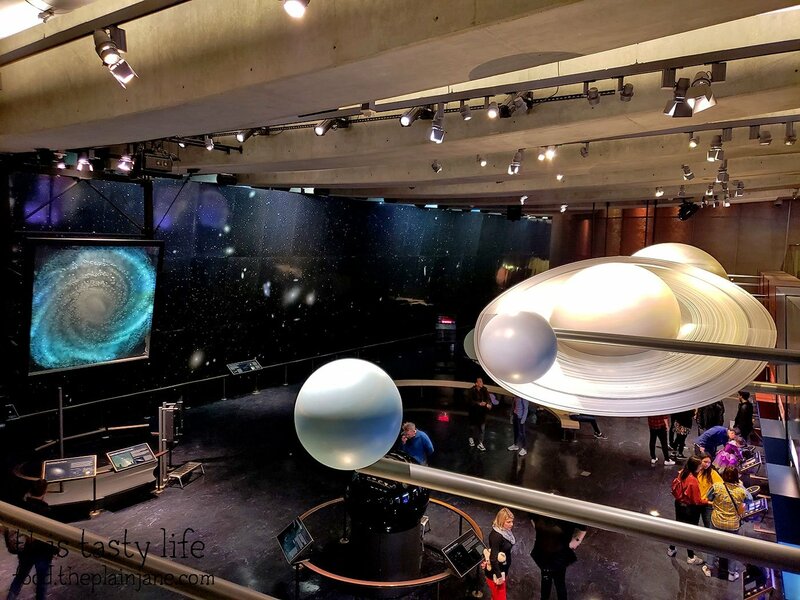 Mostly we just walked around, bumped into people, looked at the planet stuff, and talked. For dinner I told Alyssa I wanted to eat dumplings! 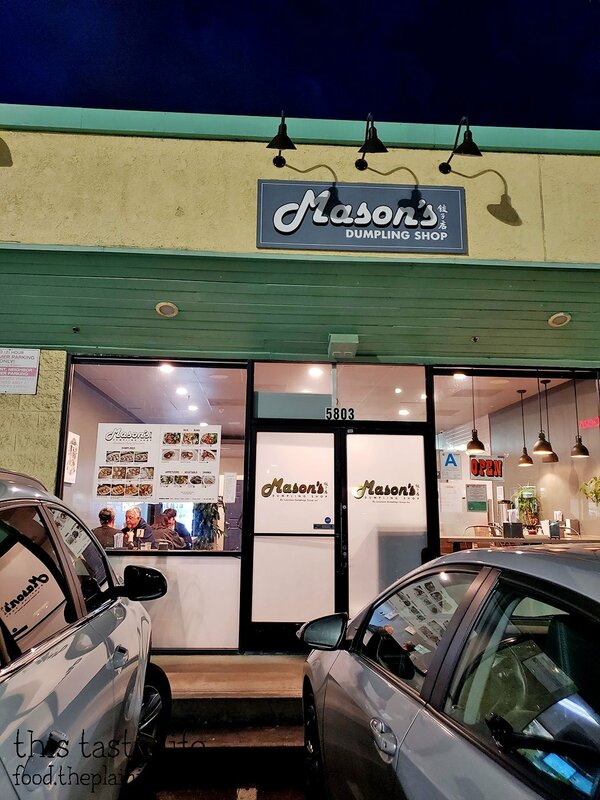 We went to this spot in Highland Park called Mason’s Dumpling Shop for dinner. We parked a couple blocks away and walked over for dinner. The shop isn’t very big but we managed to get a table and order our food without much trouble or much of a wait. That was nice. I love Din Tai Fung, but sometimes I don’t want to wait in line forever for food. 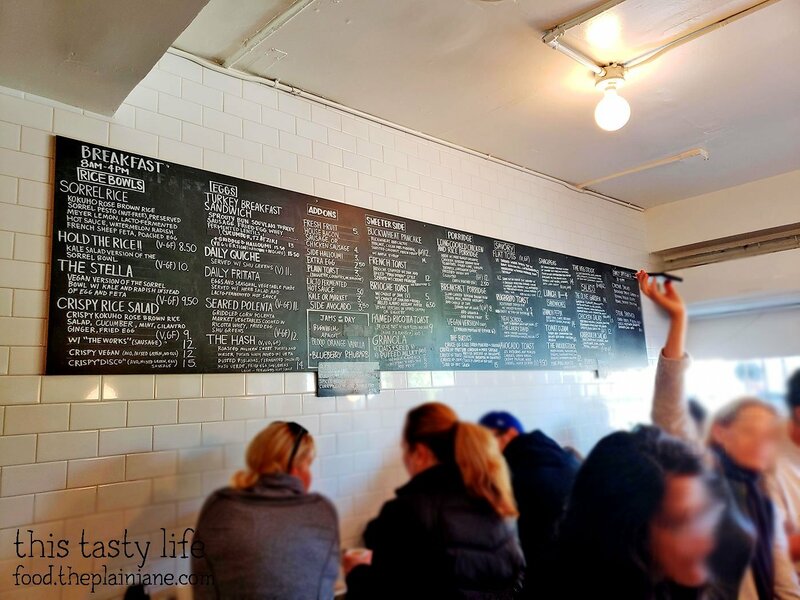 Mason’s Dumpling Shop is owned by the same people that run Luscious Dumpling in LA. I read an article online about how Mason’s Dumpling Shop would run out of dumplings by the afternoon, but luckily that wasn’t the case for us. We did have an early dinner though, around 5pm or so. 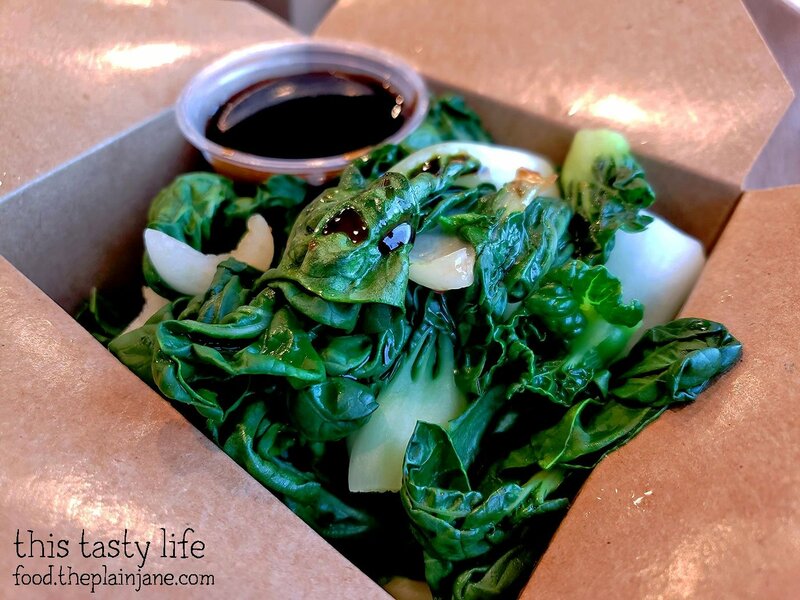 We wanted some greens and got an order of the Baby Bok Choy [$5]. It comes with a side of oyster sauce. Nice and light! 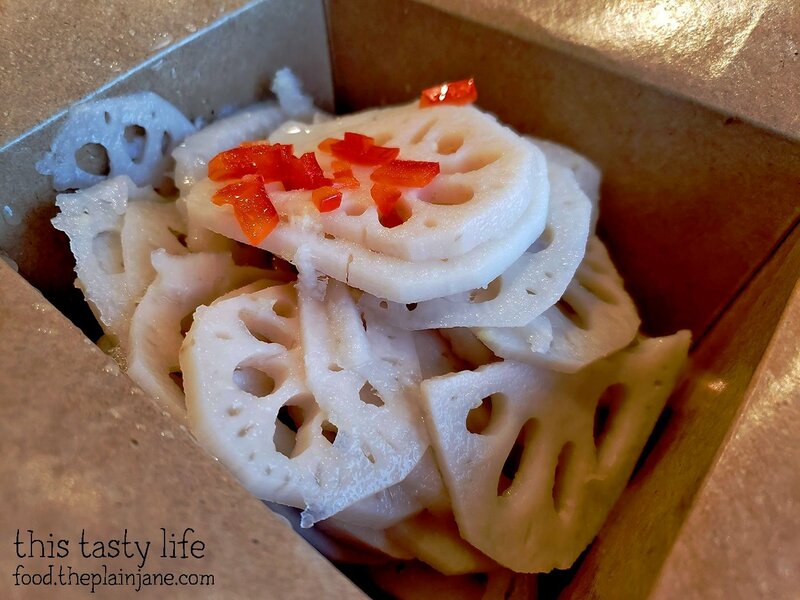 Alyssa and I had never tried Lotus Root [$5] before so we gave it a shot. I loved how crunchy it was! Pretty mild in flavor with a sweet and sour thing going on. Would eat again. 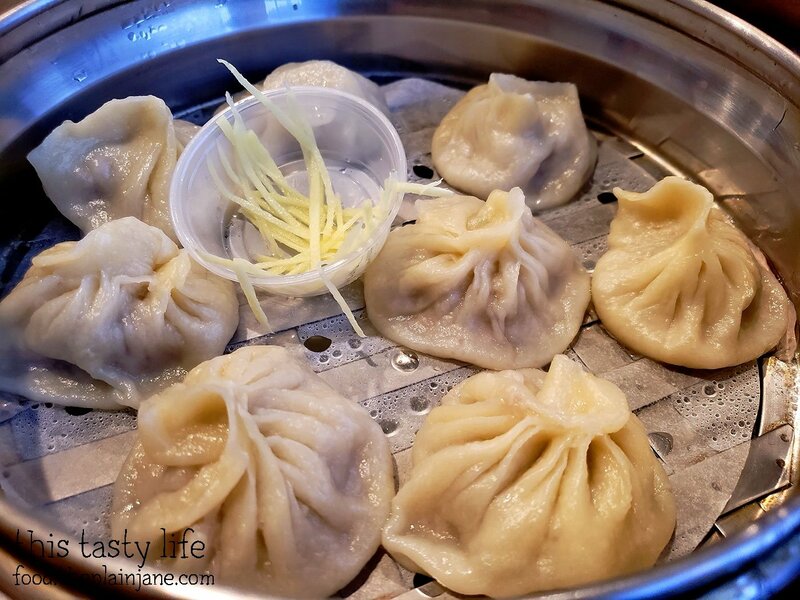 We ordered three sets of dumplings because… well, obviously we had to try multiple kinds! 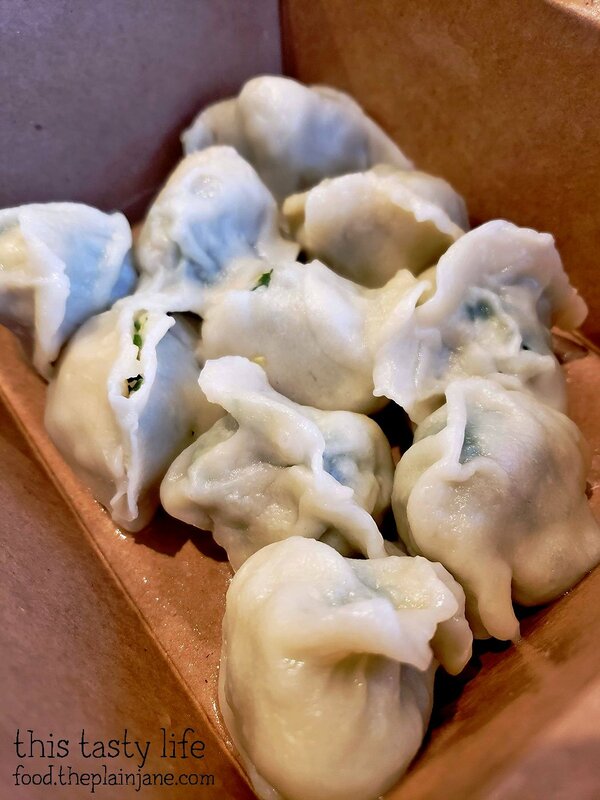 The first one we got was the Boiled Chive, Pork, Egg, & Shrimp dumplings [$9]. Really really good, excellent wrapper and yummy filling. Soft, warm, and delicious. 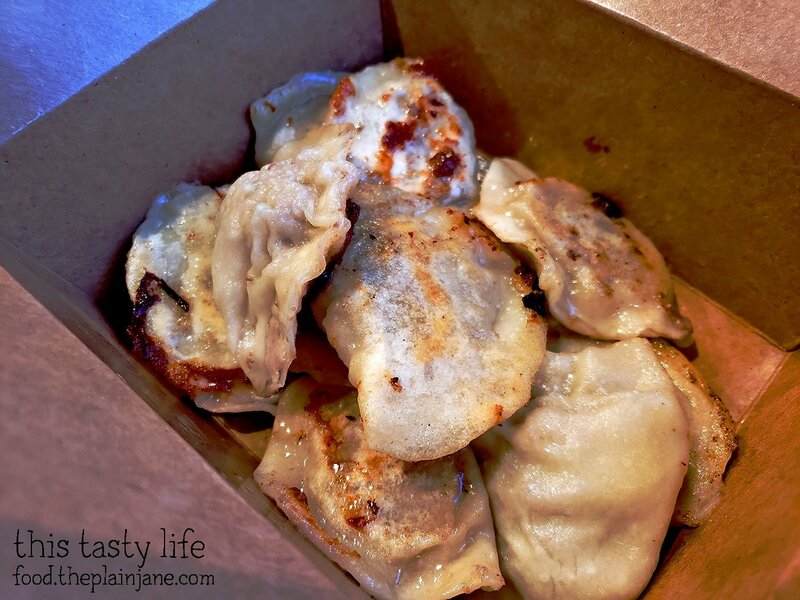 Next we tried some pan fried dumplings – specifically the Pan Fried Pork Dumplings [$9]. It’s a toss up between the boiled dumplings and these pan fried ones – I can’t decide on a favorite! Mostly I just stuffed these juicy suckers into my mouth and was in happy dumpling heaven. I really liked the crispy crust on the dumplings paired with the juicy pork on the inside. YUM. Last but not least… Steamed Soup Dumplings with Pork! These had a fair amount of soup in them and luckily were not as boiling hot as other soup dumplings I’ve tried (no one was hurt eating hot soup dumplings on this trip). Not as good as others I’ve tried, but nothing to complain about really. Fair amount of soup and filling, wrapper was a bit chewy, but still yummy. Eat soup dumplings and be happy! I would totally bring Jake here to eat dumplings. And I plan to do that in the future. Quite tasty!! 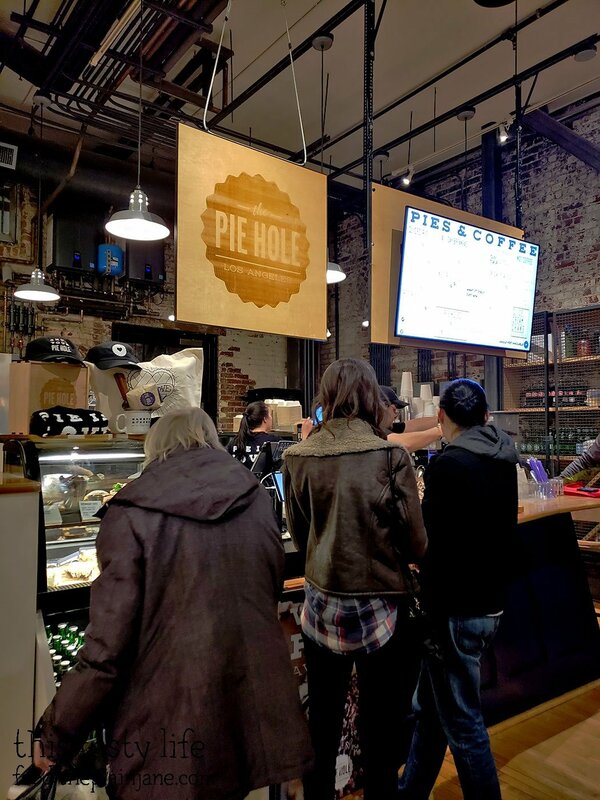 I have always wanted to visit The Pie Hole after following on them on Instagram for awhile. Their pies always look so tasty! This was over in Pasadena, and because parking sucked, Alyssa dropped me off to get pies while she drove around the block. On their Instagram I saw they were featuring their Lonely Pie for Valentine’s Day. 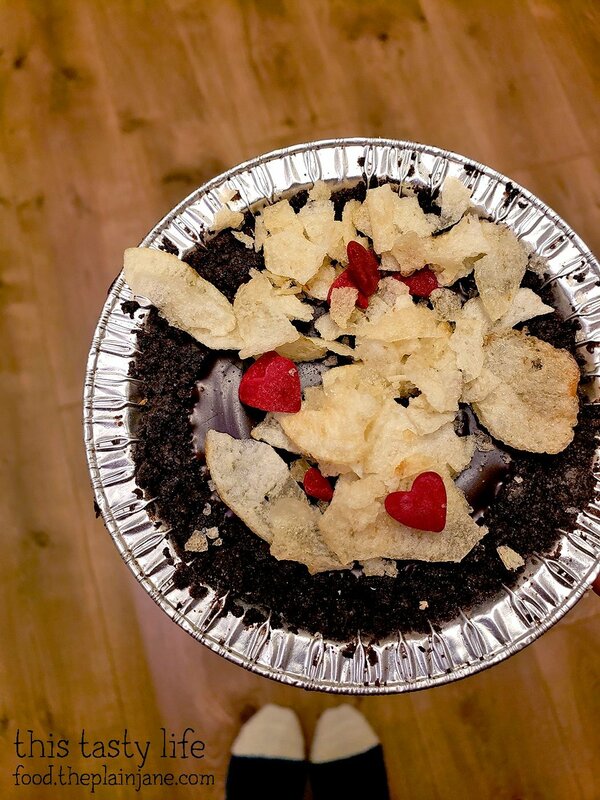 It’s a pie with an Oreo crust and potato chip crust, peanut butter filling, chocolate ganache, and topped off with potato chips. OF COURSE I was gonna get this pie!! Salty and sweet with peanut butter and chocolate! YESSSSS. And it was delicious. I loved the balance of the salty & sweet with the chocolate and peanut butter and the crunch of the salty potato chips on top. I got a kick out of the little hearts they sprinkled on top, too, for Valentine’s Day. Sadly this pie is gone and no longer available. But apparently it’s a fan favorite so it’ll probably be back. I picked up a pie for Alyssa’s husband, Jeremy. But really it’s a cheesecake? A cheesecake pie? 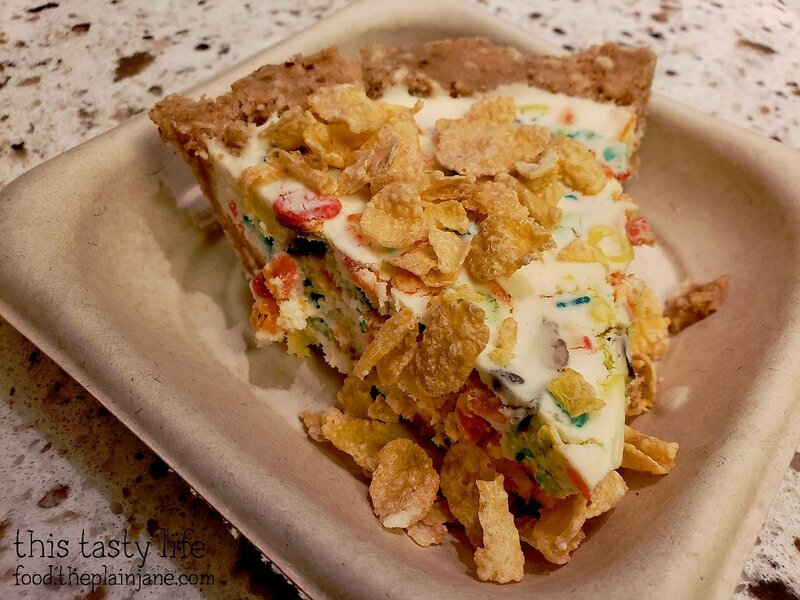 It’s called the Cereal Killer and it comes with different cereal on top. I didn’t try it. I should have. I think I got full and forgot. I did have a bite of Alyssa’s Mexican Chocolate Pie though. 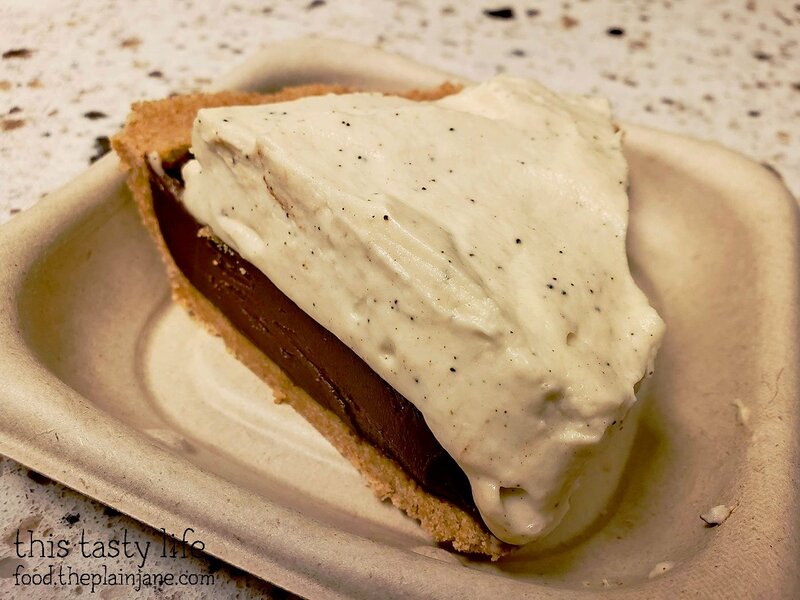 The Mexican Chocolate pie is made with cinnamon, orange zest, and pasilla peppers to give it a little kick! It’s not too spicy though – just enough to wake up your tastebuds to go “whoooooa”. I liked it. 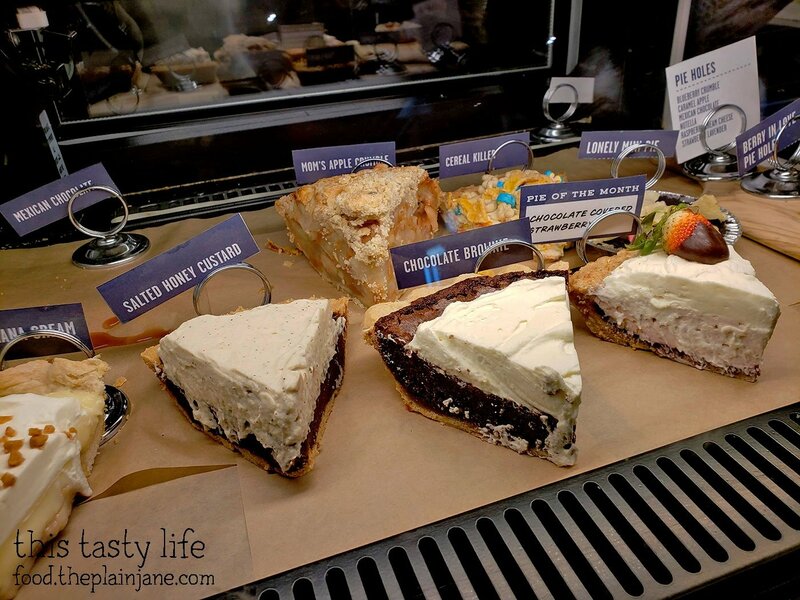 I still want to try their Earl Grey Pie one of these days so I GUESS I’ll have to revisit. Heh heh. Thanks to Alyssa (my Matron of Honor!!) 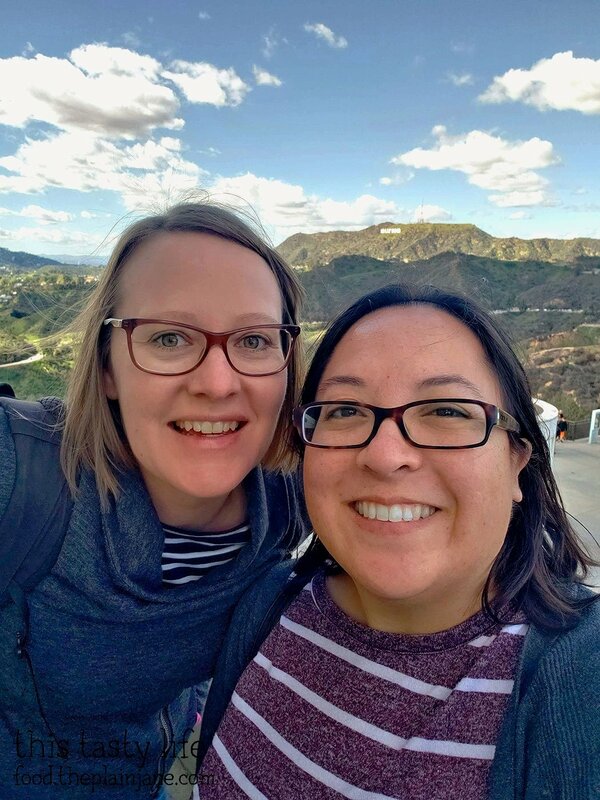 for hosting me for a fabulous LA girl’s weekend! What a fun weekend! I’ve heard about Sqirl so it was good to see your take on their food. Man, those pies looked so good as well as those pan fried dumplings. The soup ones looked kind of deflated though . Hi CC – Yes, it was a great weekend! That porridge at Sqirl was SO GOOD I would eat that all the time, I wonder if I can find their recipe. The pies were fantastic, I want to go back and try their famous earl grey pie in the future. 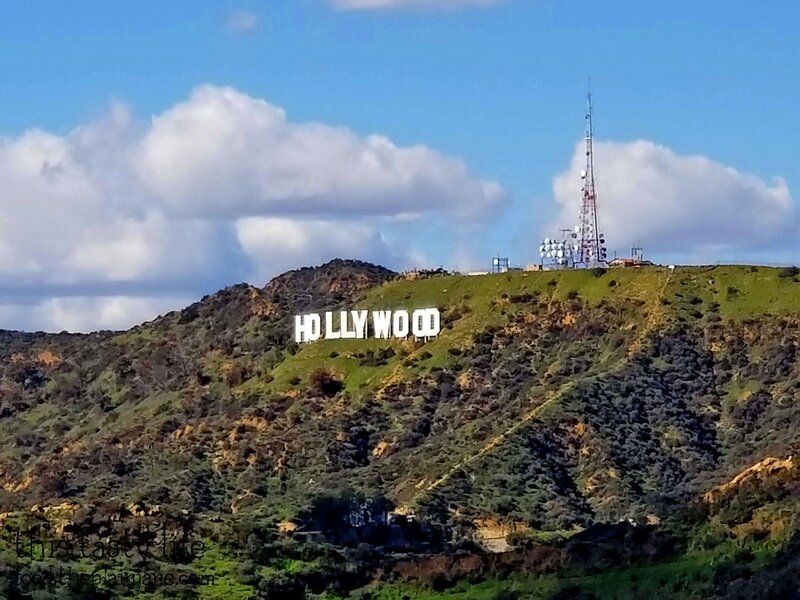 Great LA trip! 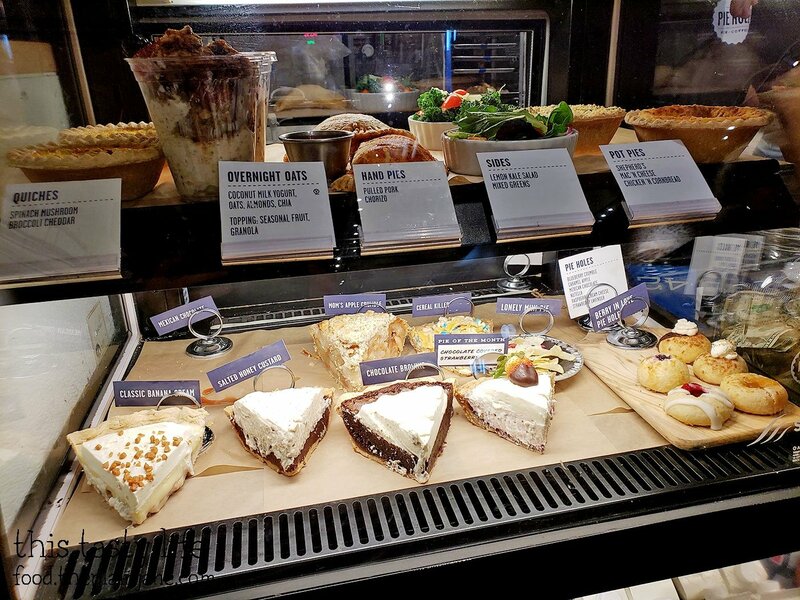 Looks like some great desserts at Sqirl and pies at Pie Hole.